After nutrition, training is the next most important step in changing your body. The last is recovery time. If you do not allow your body to recover adequately from exercise, then you run the risk of stalling your progress completely. Good quality sleep in sufficient quantity is essential; at least 8 hours good quality sleep per night. This section will focus mainly (but not exclusively) on strength training for a number of reasons; strength training has been shown to burn calories for longer than just cardio1, it preserves muscle and increases levels of several beneficial hormones within the body. Unless you are training for a specific endurance event; you should always include some strength training. However, strength training alone is not enough. Some cardio exercise is also necessary and there are also a range of exercises that sit between the two (i.e. endurance work with weights). Nothing else is as useful and adaptable as free weights. Unlike gym resistance machines, they use a range of muscles for every exercise. Importantly, they work the smaller, stabilising muscles which is important both for strength and for posture – especially if you want to avoid postural problems later in life. This includes things like a sled (a flat platform you can weight and drag), sandbags (used for a variety of specific exercises), resistance bands (used for things like running from a standing start whilst anchored by the band. This increases power output). Technically kettlebells would fit in here as they require a certain amount of knowledge to use properly. However they can be used just as dumbbells as well. You will see these in almost every gym/fitness centre. Large machines, usually with a seat and dedicated to just one specific exercise. From a gym’s point of view they allow people to train without specialist knowledge of form (the precise body dynamics) or technique. However, supporting and stabilising muscles are often not used in the manner in which they should be, muscle chains are not generally exercised (see later) and the restricted movement means they simply do not provide the comprehensive benefits of free weights. Some specific exercises (such as leg press, or seated row) can be useful, but generally speaking these machines are not recommended as ideal. They can be good to get the feel of a particular movement but ideally you should use free weights as much as possible. However, novice trainers may find them easier to use initially. This is exactly what it sounds like; using your bodyweight to provide resistance. Examples include; press-ups, pull-ups, chin-ups, muscle-ups, leg raises, roman chair, etc. Generally speaking, cardio training falls into one of two categories: Endurance and Power. Endurance events are things like marathons; they involve a lower intensity of exercise for a longer duration. Power events are things like sprinting; higher intensity in shorter intervals. Cardio training is specifically aimed at increasing cardiovascular function (increasing lung capacity, improving heart rate), endurance and power output. There are several definitions for this and like “functional training”, it is a much over-used and hotly debated phrase. For our purposes it will refer to strength type exercises, performed as though they were cardio exercises. So for instance; doing squats with a smaller dumbbell rather than two heavy dumbbells or a barbell – and doing a greater number of repetitions. Metabolic workouts incorporate elements from both strength and cardio in order to improve health and physical function across the board. Strength training provides a solid base for all movement. It potentially increases muscle mass and there is also a direct relationship between increased muscle and lean body mass. For instance, just gaining 1lb of muscle will require an extra 300 Calories per week to maintain, so you have effectively increased your BMR and therefore your calorie burning by just adding some muscle. Unlike body fat, muscle tends to be fairly evenly distributed (depending on your exercise regime) and contributes to a leaner, toned physique. Body fat tends to accumulate in specific areas more than others for a variety of reasons. Cardio training increases available oxygen and that can help in fat burning; it also provides obvious overall benefits by decreasing resting heart rate and improving a number of physiological functions. Increasing your cardio fitness will directly and positively impact your ability to perform strength training exercises by increasing the level of oxygen available to your muscles. Metabolic conditioning is in some ways the best of both worlds, but at the same time will not have the same effect on either strength or cardio output (generally…there are exceptions) as strength or cardio specific training. All exercise that requires strength or uses resistance can cause a number of micro tears in muscle fibres. 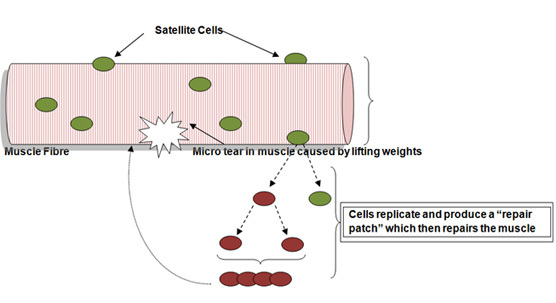 The damage causes dormant satellite cells to replicate themselves; forming one new dormant cell and one cell that then continues to replicate. The new cells can then be used directly to repair the muscle tissue, or they will sometimes join with cells from other areas (such as bone marrow) to make the repair. Most weight training will cause this effect. The body repairs the cells as above and then, assuming a good nutritional intake, goes through a process of adaptation to try and prevent the muscle from being damaged by the same thing again. This is partly why exercise, especially weight training, causes you to feel sore the next day, because you’re damaged. This is also why you hit a plateau with exercise, because you’ve adapted to it. To progress you need to raise the game again. This could be increased weight/resistance, running faster or longer, lifting the weight more times – there are a range of ways of adapting training to keep progress going. You should bear in mind that a lot of strength gains, especially when you first start training, are neural adaptations. Your nervous system is simply getting better at recruiting muscle units to do the work. This is why people often see dramatic and rapid strength gains when they first start training. Cardio exercise does not produce quite the same amount of damage as strength training, but it is possible for it to cause damage. However, the process of repair/adapt is still essentially the same for cardio exercise as it is for strength. If you find it difficult to run a mile then the chances are your lungs are not capable of circulating sufficient oxygen. However, if you keep taxing your lungs by practicing that mile run, then eventually you will find it much easier. At this point, your heart and lungs have adapted to supply sufficient oxygen for the exercise. Given that any exercise “damages” the body in some way it is crucial that you start any new program – or any change in program – slowly and carefully to let your body acclimatise. If you try to do too much too soon, you are likely to find yourself in considerable pain or injured. It is also essential that you allow sufficient recovery time to allow the repair and adaptation process to happen. Most of your results, whether it is fat loss or muscle gain, will happen outside of your actual training. It is the repair and adaptation process that provides the fat burning and muscle protein synthesis. In other words – you don’t grow in the gym. Training for strength, power or hypertrophy (muscle growth) all require slightly different approaches. A common method is using “periodisation” whereby you train for one thing (i.e. raw strength) for 4-6 weeks, followed by an “unloading” week where you train lighter and rest more to allow your body to catch up, then follow with another 4-6 weeks of something else (i.e. power) and so on until you repeat your first training phase. Whilst you may find you have lost a little strength when you go back to raw strength work, the overall effect over time is to increase all of the differing aspects of strength training more or less equally (depending on diet and recovery). Training for fat loss generally involves more cardio based training, but strength training will also greatly benefit any fat loss program. There are many sources of great information on training; what you need depends on your own personal goals. Most gyms and fitness centres have staff trained to design exercise programs, or there are hundreds of books and websites dedicated to exercise. You may have to try a few things before you settle on what works best for you.